Installation of the Federation Rocks display is the first step towards establishing the National Rock Garden, which will celebrate Australia’s rich geological heritage with a permanent display of the rocks that have shaped our nation. 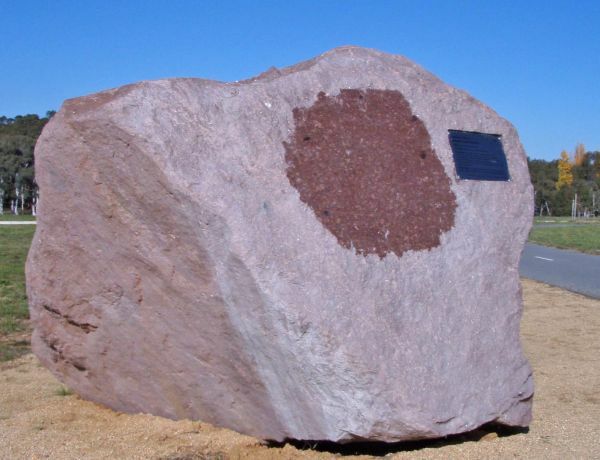 The Federation Rocks commemorate the Federation of Australia and form a centenary link to the six-sided Canberra Foundation Stone, laid in March 1913. The rocks are displayed from east to west in the order of the official establishment of the six British self-governing colonies that formed the Commonwealth of Australia in 1901. The Territories were added in 1911. Each of the eight large rocks is significant to the State or Territory from which it comes and each has an interesting story to tell that is directly or indirectly related to nation building, whether it be mineral resources and economic wealth, or building and decorative stones or rocks that shaped our iconic landscapes. Each rock is also a part of the geological story of the establishment of Australia as a continent. Formation: This limestone formed in warm, shallow, tropical seas when Australia was part of the Gondwana supercontinent. It contains occasional fragments of coral and shell. 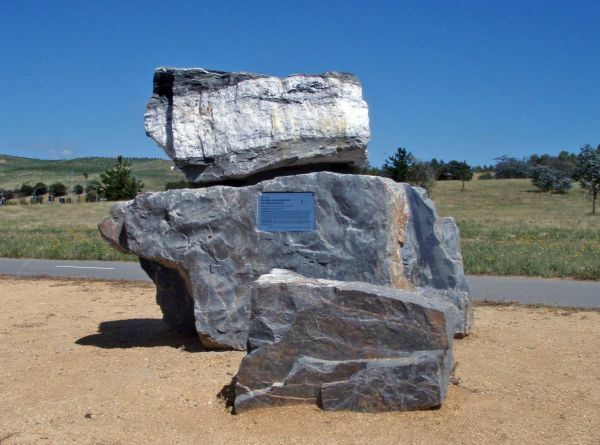 Significance: Outcrops of this rock along the Molonglo River gave the Canberra region its early European name of ‘Limestone Plains’. Most of these limestone outcrops are now covered by the waters of Lake Burley Griffin. Subsurface beds of limestone, and associated caves, caused engineering problems for the foundations of many Canberra buildings. Donated by: The Government of the Australian Capital Territory and the Department of Defence. 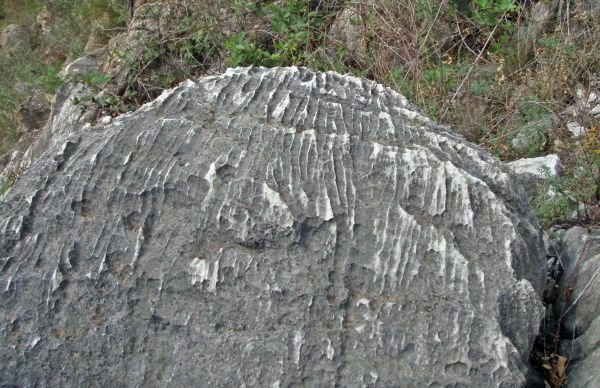 Canberra limestone, showing typical limestone weathering features called rillenkarren (solution flutes); Image courtesy Brad Pillans. Formation: Middle Triassic braided rivers carried vast quantities of quartz-rich sands, from the south and west, into what is now the Sydney region. The sands compacted and hardened to become an extensive sandstone formation. Significance: Hawkesbury Sandstone dominates the scenery around Sydney. Its surface preserves many Aboriginal carvings and paintings. This ‘quarry block’ is from near the ‘Paradise’ Quarry, one of the most famous 19th century quarries in Pyrmont, which supplied ‘yellow block’ sandstone for the construction of many landmark historic buildings in NSW. Donated by: The Government of New South Wales. Hawkesbury Sandstone quarry block at the NRG; Image courtesy Sue Fletcher. Formation: A low silica variety of granite, this plutonic rock formed from slowly cooled magma at great depth. This rock features large red crystals of orthoclase feldspar. 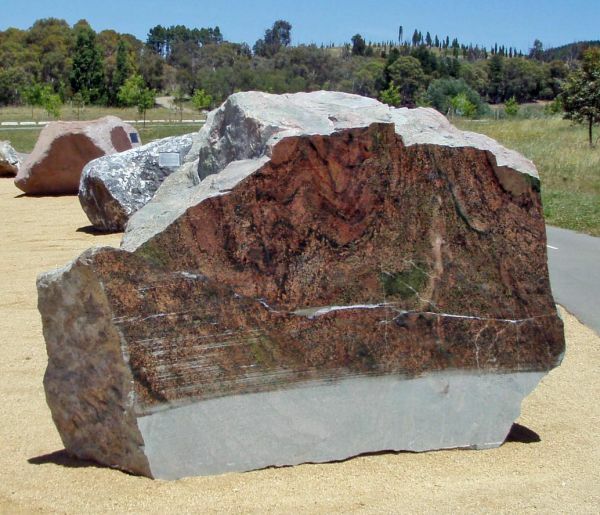 Significance: This decorative stone is the red ‘granite’ widely used in Darwin buildings, including the NT Parliament House and Supreme Court. Formation: This limestone formed in a tropical, shallow marine environment on the east Australian continental margin. It contains abundant fossil bivalves, corals, sponges and brachiopods, including shells of giant megalodont clams, many of which are preserved in their upright growth position. Significance: This abundantly fossiliferous limestone can be regarded as a Devonian precursor of the Great Barrier Reef, Queensland’s most iconic natural feature. A spectacular decorative stone, exported around the world. Close-up of polished Chinaman Creek Limestone; Image courtesy Michelle Cooper. Formation: The heat and fluids from granite intrusions formed this distinctive metamorphic rock. The colourful minerals include epidote, actinolite and diopside (green); feldspar and haematite (orange and red) and magnetite (black). Quartzdolomite veins include pyrite and copper-bearing chalcopyrite. Significance: This spectacular ‘Harlequin Stone’ is a widely exported decorative stone. It also expresses the geological event that formed the giant Olympic Dam orebody and the historic Moonta and Wallaroo copper mines. Oorlano Metasomatite at the NRG, showing polished face; Image courtesy Brad Pillans. Formation: During the breakup of Gondwana, dolerite magma was injected as subsurface dykes and sills (sheets), across most of Tasmania. As the magma cooled and crystallised, regular vertical cracks propagated through the sills, forming polygonal columns. Significance: Dolerite is unusually widespread in Tasmania, and is appropriately referred to as ‘the rock that made Tasmania’. It forms the iconic ‘organ pipes’ landscape above Hobart, as well as on Tasman Peninsula and the Central Plateau. Dolerite tors and columns, Mt Wellington Tasmania; Image courtesy Karen Askew, Crash Graphics. Formation: The lower rock was deposited as sand and mud in the ocean off eastern Australia during the Ordovician. In the early Silurian the sand and mud pile was folded, metamorphosed and injected with hot siliceous fluids to form white quartz veins like the upper rock, often with small amounts of metallic sulphides, and sometimes gold. This specimen contains no gold. Significance: These rocks are typical of the famous Bendigo & Ballarat Goldfields, which yielded vast riches during Victoria’s gold rushes of the 19th and 20th centuries. Bendigo metasandstone and Ballarat quartz; Image courtesy Brad Pillans. Formation: This banded iron-formation (BIF) was deposited from dissolved ferrous iron in the circulating waters of an early global ocean under a reducing atmosphere. The alternating bands show the marine environment see-sawing between oxygen rich (dissolved iron precipitates) and oxygen poor (silica precipitates), as microbial activity varied. 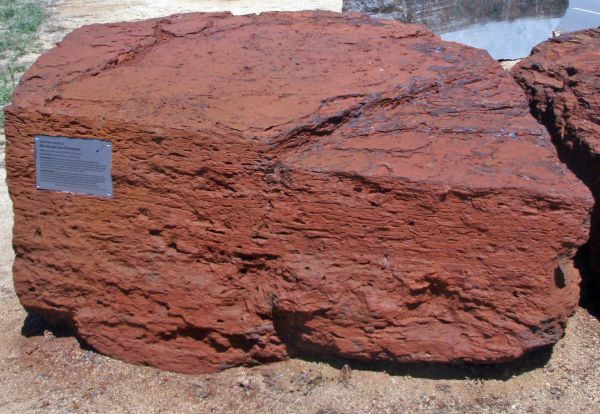 Significance: It is the distinctive, spectacular precursor of many of the globally significant Pilbara iron ore deposits and thus one of Australia’s most important rocks. Pilbara BIFs are the best exposed, least metamorphosed and least deformed BIFs on Earth and contain the world’s largest concentration of iron, amounting to billions of tonnes of minable ore.
Brockman Iron Formation; Image courtesy Brad Pillans.